Space aliens called mimics (lethal, metallic, whirring Battling Tops) have landed in France and after checking their advance at Verdun, a global force plans a knockout punch in a D-Day redux. Tom Cruise is unexpectedly assigned to that landing and upon his near immediate death on the beach, wakes up ala’ Groundhog Day to relive the event, again and again. The hero of Verdun, Emily Blunt, recognizes the potential and together, they train, re-live and work to gain the advantage. 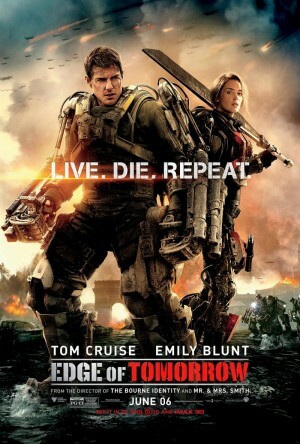 Doug Liman’s (Swingers, The Bourne Identity) film is clever, straightforward in concept, and for sc-fi, plausible. Cruise is refreshing playing a reluctant if not cowardly cad thrust into the role of mankind’s savior and Blunt is a convincing, modern Joan of Arc. The blend of London and Paris with CGI is expert and the alien force is intricate and scary. The picture also sports a sly, muted sense of humor, which Cruise delivers alone, as Blunt takes on the role of the tortured, stoic warrior. Naturally, it tries to establish a deeper connection between the leads, an attempt that largely fails (Cruise is still cursed with a 100% to 0% charm to romance ratio), but Liman doesn’t stubbornly force the issue. The end is also unsatisfyingly upbeat. Minor complaints.